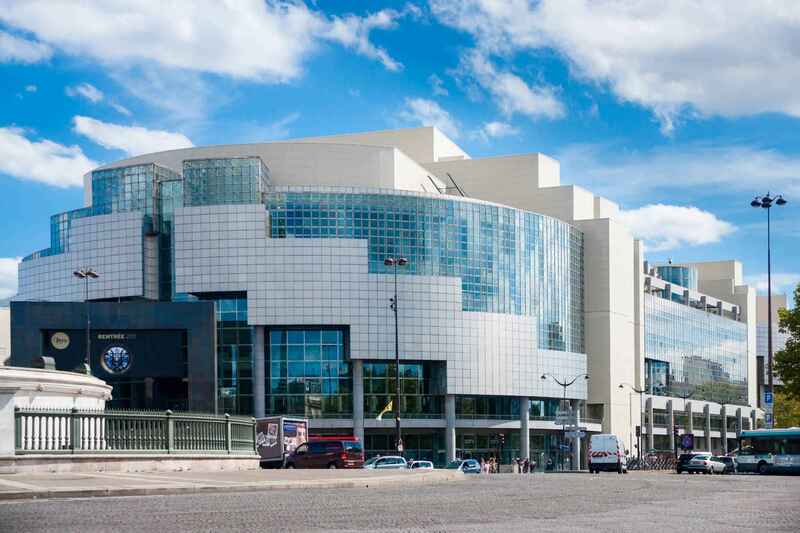 The Opéra Bastille ) (Bastille Opera House) is a modern opera house in Paris, France. Inaugurated in 1989 as part of President François Mitterrand’s “Grands Travaux”, it became the main facility of the Paris National Opera, France's principal opera company, alongside the older Palais Garnier; most opera performances are shown at the Bastille along with some ballet performances and symphony concerts, while "Garnier" presents a mix of opera and ballet performances. Designed by Uruguayan architect Carlos Ott, it is located at the Place de la Bastille, in the 12th arrondissement; it seats 3,309 people in total, with a main theatre, concert hall and studio theatre. 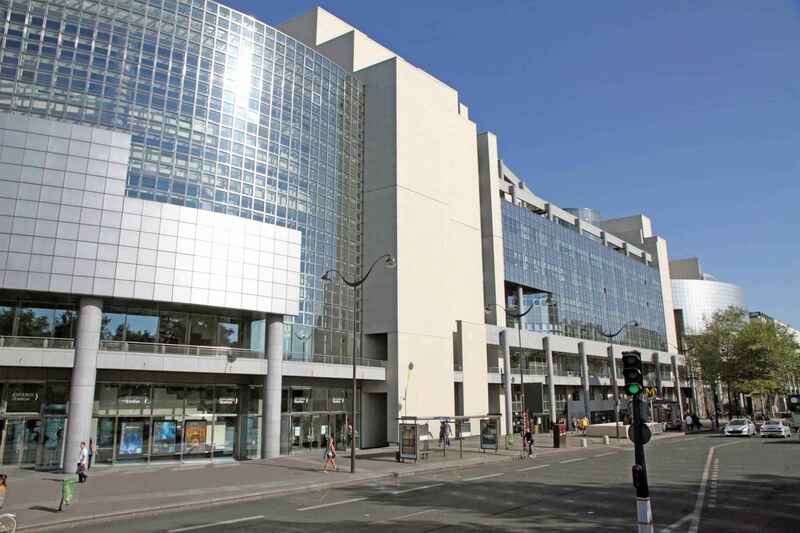 The Opéra Bastille is located on the place de la Bastille. In order to make it "blend into" the landscape, the square was not remodeled to be aligned with it in a general parallel plan, but the left-hand side of the facade was left partly hidden behind an older and smaller building, which was expected to give the impression that the opera house had been part of the area for a very long time. The building then elongates itself behind the facade following a generally triangular shape, hidden by other buildings around. The theatre is “surmounted by the opaque cube of the stage building and wrapped in gridded walls of glass… the Opera stands sociably open to the world outside, whereas the foyers, with their broad overview of the city, have the slick, impersonal look of an airport lounge.” These foyers run around the theatre's auditorium on several levels and give the external glass facade its round shape. Access to the entrance hall is directly from the square at street level; although a monumental external staircase leading to the first-level foyer and a direct underground access from the Bastille subway station to the entrance hall were built, they were eventually closed. The theatre's auditorium was designed with 2,723 seats, later reduced to 2,703; it is organised in an arena format with two huge balconies at the back, with a few narrow balconies on the sides. In a somewhat militant departure from the Palais Garnier, which has several dozen types of seats and does not offer stage visibility from all of them, every seat at the Opéra Bastille offers an unrestricted view of the stage, it is the very same type of seat with the same level of comfort, and there are no boxes. Subtitles are visible from every seat except for those at the very back of the arena and of the first balcony. In 2005, two small standing room areas were created at the back of the arena; tickets are sold for €5, only on the evening of the performance. There is no "royal" or “presidential box”; instead, one of the regular seats in the arena, on the “VIP” row just after the central aisle, is considered the presidential seat, although not all Presidents since 1989 have been avid opera-goers. Due to its size, the auditorium is frequently—and unfavourably—called a "vessel", and, compared to other world-class opera houses, the acoustics have been described as disappointing at best. One technical feature destined to make it better is that the floor of the orchestra pit is actually a small elevator, which makes it possible to adapt the pit to the requirements of the performance, elevating it for a smaller orchestra and lowering it for a larger and louder one; in its largest configuration, the pit has room for 130 players. The hall is generally cold in colour due to the prominence of grey granite, black or white stone and black fabric in the structure and decoration as well as to the lightning from the giant white glass ceiling, although the use of pearwood for the seats and handrails and of oak for the floor brings a warmer, light brown touch. This modern design has been controversial ever since the house's opening, with part of the audience preferring the profusely ornate and luminous decoration of the more traditional Palais Garnier. The backstage occupies an enormous volume (5,000 m²), six times larger than the sole deck: the deck area is flanked left and right with areas of the same size, and these three areas are replicated towards the back of the theatre. A system of rails and a rotating dock make it possible to roll entire sets on and off on giant motorised platforms in a few minutes and to store these platforms on the available backstage spots; quick changes of set enable the artists to rehearse a work in the afternoon and to perform another one in the evening, something impossible at the palais Garnier. The use of such platforms also makes it considerably easier to use three-dimensional sets rather than traditional flat images. Under the deck is a giant elevator, which is used to lower unused set platforms to an underground storehouse as large as the backstage itself. The building also includes a rehearsal room that replicates the theatre's pit and stage area. Opéra Bastille - Introduction | eTips Inc.